Welcome to the Ultimate Resource for Professionals Using Motor Vehicle Records! 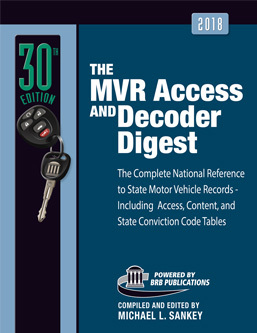 The MVR Decoder is ideal for anyone working with motor vehicle record data including the insurance industry, the trucking industry, HR and employers of drivers, attorneys, risk managers, private investigators, and background screening firms. Translates the codes and abbreviations of convictions and withdrawals found on driving records. Reports on states' record access and privacy regulations. Reveals the access procedures and fees for these motor vehicle records: driver, vehicle, accident, lien, and even watercraft records. Informs where to find free online DL status checks plus how to use driver monitoring programs available to employers and insurers. Other topics include license appearance and issuance, suspensions and revocations, point systems, and much more. Spells out the Federal regulations affecting commercial drivers and the issuance of CDLs and CLPs. Includes the current ACD Code Table and the SMS Motor Carrier Data Tables with Conviction Severity Weights. The 2018 MVR Access and Decoder Digest is Now Available!! !